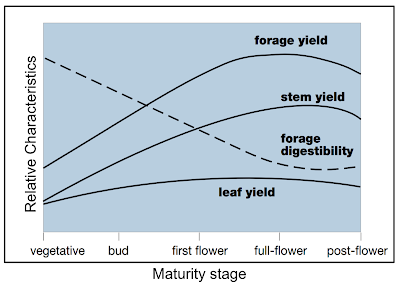 Balancing alfalfa tradeoffs between yield, quality and persistence reminds me of the "Good, Fast, and Cheap" paradigm where only two can be selected (Figure 1; Dev. 2018). For example, let's assume an alfalfa farmer needs high-quality alfalfa and plans to reseed the alfalfa after four production years. This means that the farmer needs the alfalfa stand to deliver high-quality alfalfa each year for the four-year duration consistently. Here is the dilemma: When the farmer increases the cutting frequency to harvest less mature plants, they are lower in lignin and quality is improved. However, the alfalfa stands are less able to build up root reserves and are at a higher risk of reduced persistence (Brink and Marten, 1989). On the surface, the pick-three option isn’t apparent. 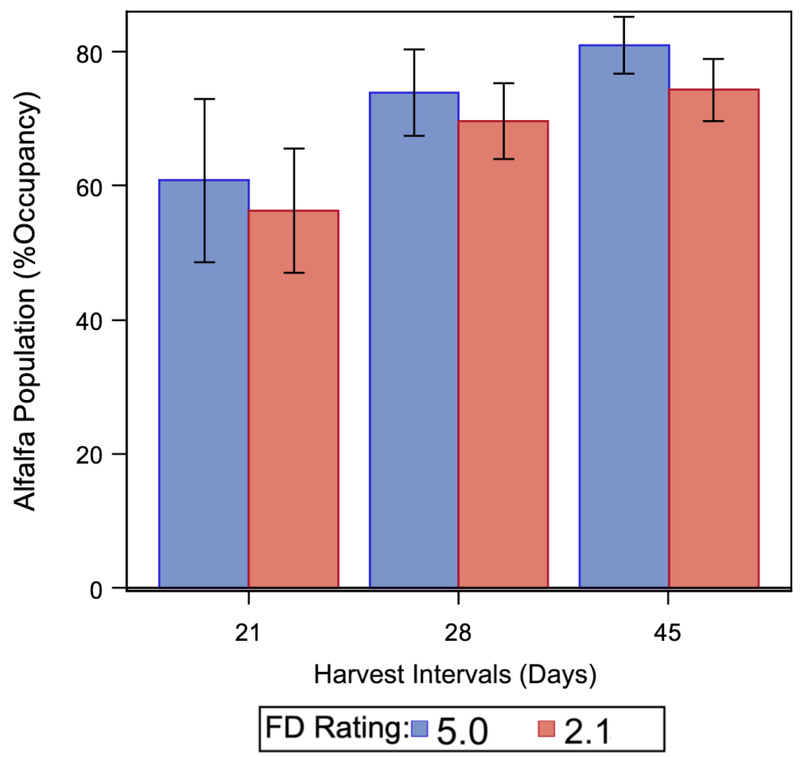 Recent advances in alfalfa breeding suggest emerging opportunities to attenuate these tradeoffs, potentially allowing for simultaneous improvements to quality, yield, and persistence (i.e., the pick-three). 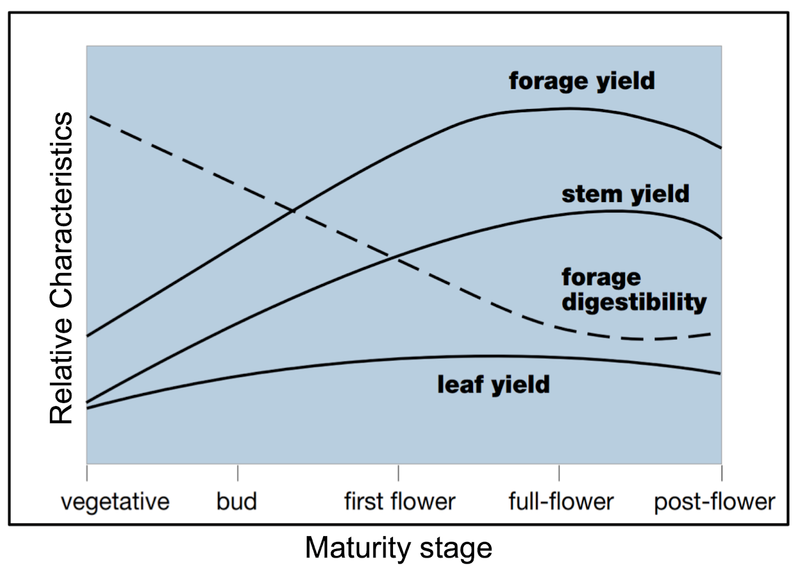 Modern alfalfa cultivars' regrowth potential (i.e., Fall Dormancy rating) has been primarily decoupled from winter hardiness, which may allow for both higher yields and persistence. 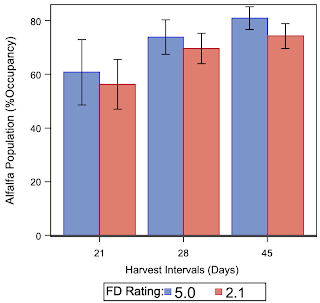 Also, new alfalfa traits have directly improved alfalfa forage quality through the reduction of lignin which may accumulate greater yield while limiting reductions in relative feed value (Lamb et al., 2012; Grev et al., 2017). 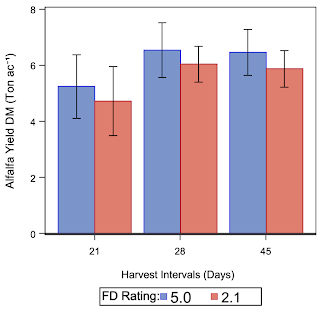 Alfalfa cultivars with Fall Dormancy (FD) ratings 2.1 (FD2.1 - very dormant) and 5.0 (FD5.0 - moderately dormant) were established into prepared seedbeds at 13 lb-live seed per acre. Lower dormancy ratings exhibit less fall growth. Weed control - Raptor and Poast were applied for broadleaf and grass control respectively. Insect pest control - Arctic 3.2 EC was applied when potato leafhoppers exceeded thresholds. Harvest - Alfalfa cultivars were harvested via a Carter forage harvester. Bulk yield samples were weighed fresh and subsampled for quality. 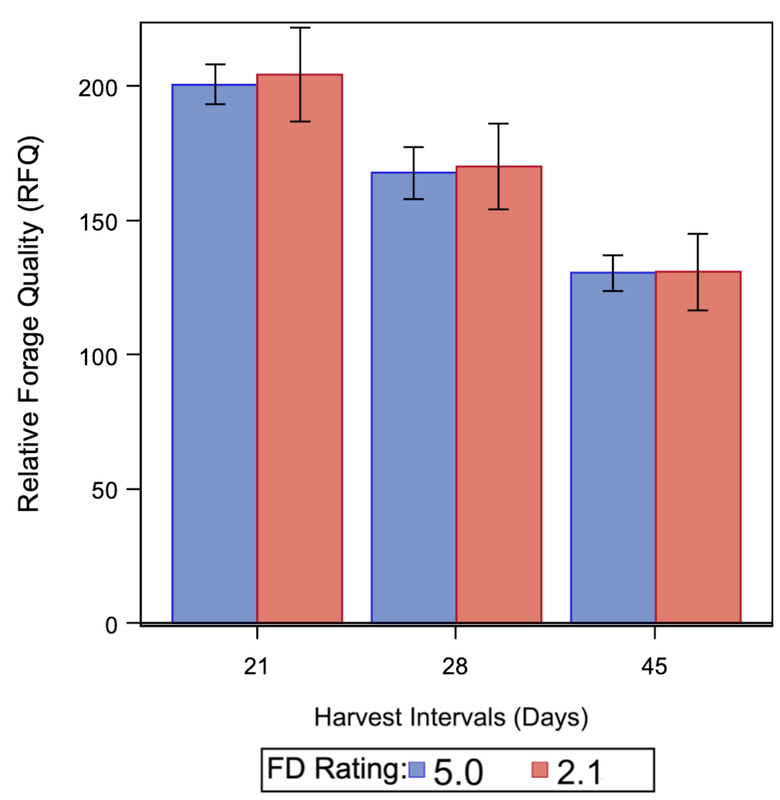 Forage quality was determined using under near infrared reflectance spectroscopy. 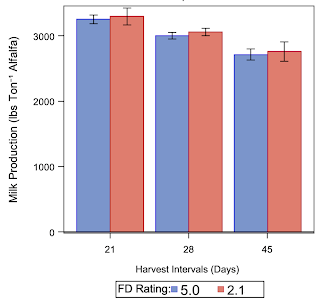 Both alfalfa cultivar and harvest interval impacted milk production where the FD2.1 cultivar produced slightly more (approx. 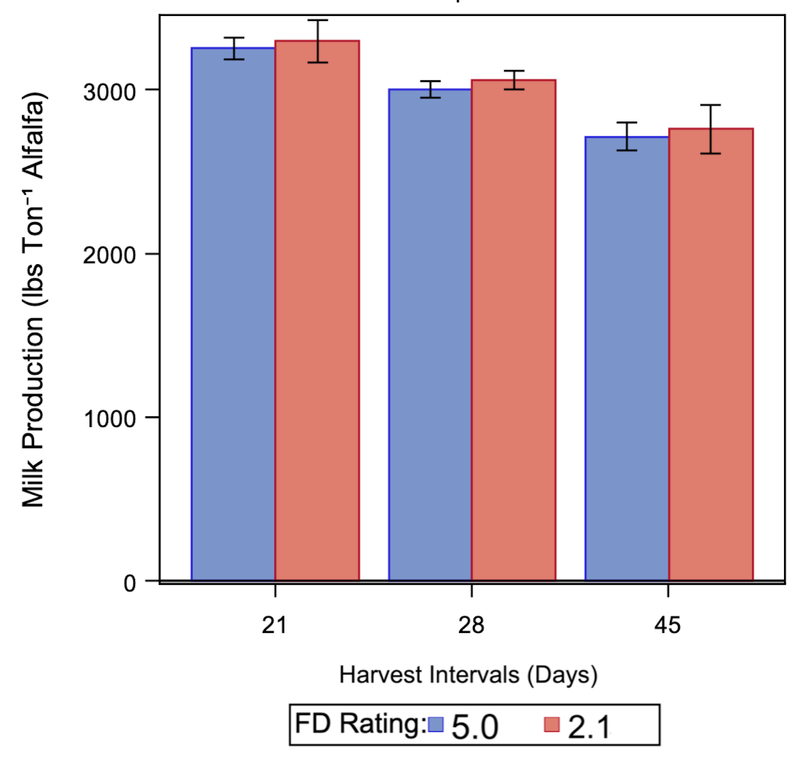 1.6%) milk per ton of alfalfa than the FD5.0 cultivar (Figure 5). Recall the third "pick-two" option was persistence and quality. 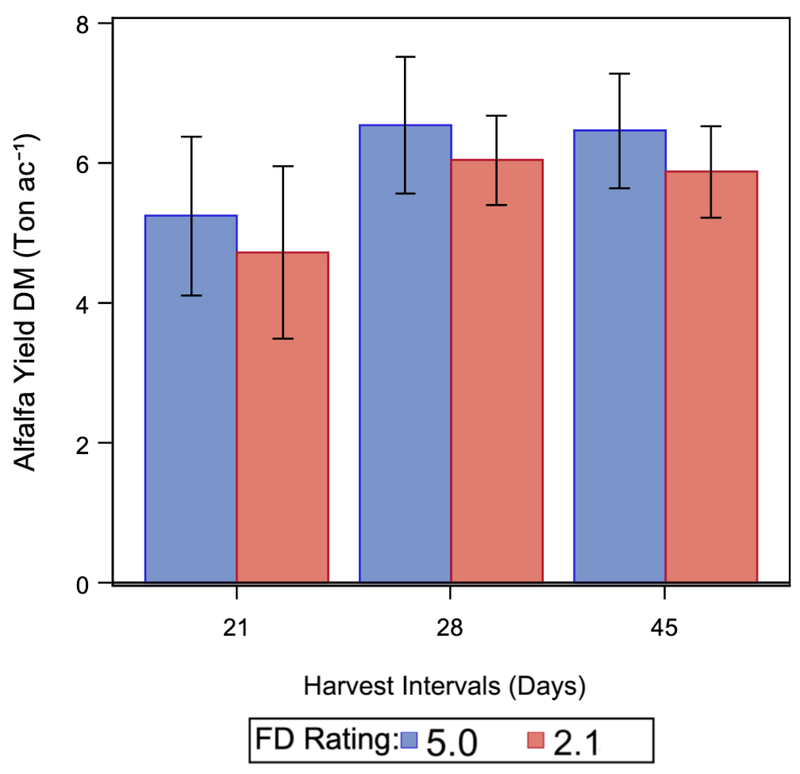 Fortunately, neither alfalfa fall dormancy rating nor alfalfa harvest interval influenced the alfalfa persistence in the third production year. Please visit Extension's forage production website for more information. You might also be interested in Alfalfa winter injury assessment and management.